The Nokia PureView 808 surprised the world when it was announced at Mobile World Congress 2012 - it features a 41 megapixel sensor. This is not only a much higher resolution than other mobile phones (with others maxing out at 16 megapixels), it's also vastly higher than compact cameras (max 18.2mp), compact system cameras (max 24.3mp), digital SLRs (max 36.3mp), and is even higher than a number of medium format cameras! 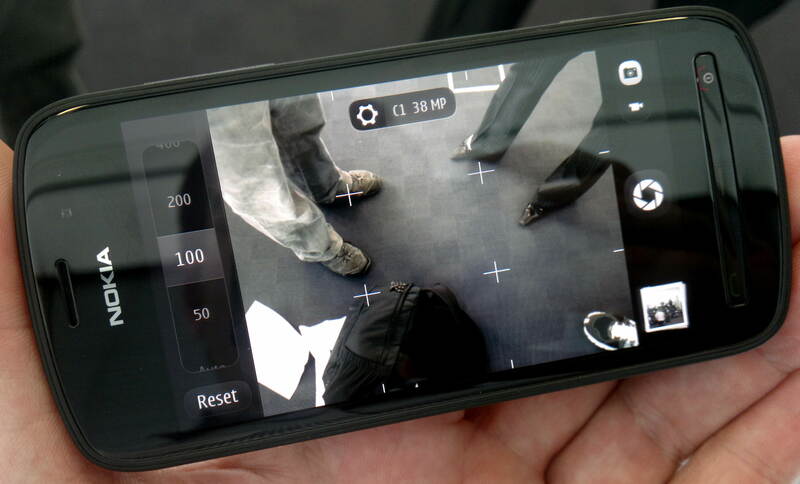 We were among a small group of journalists invited to the Carl Zeiss AG headquarters to try out this new mobile phone - and as its biggest selling point is the 41 megapixel camera, we have an in-depth look at using it as a digital camera. 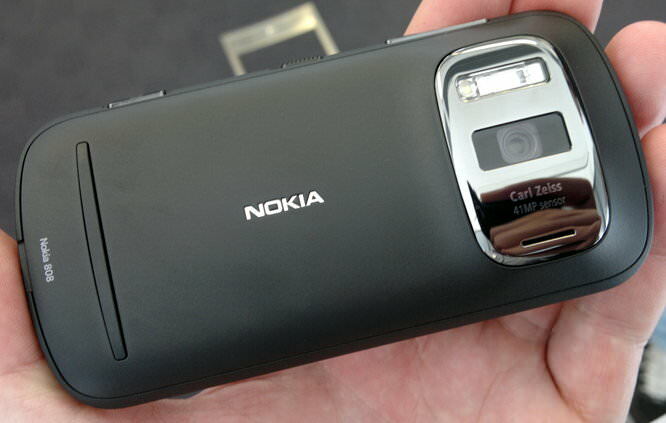 The Nokia PureView 808 runs on the latest version of Symbian. 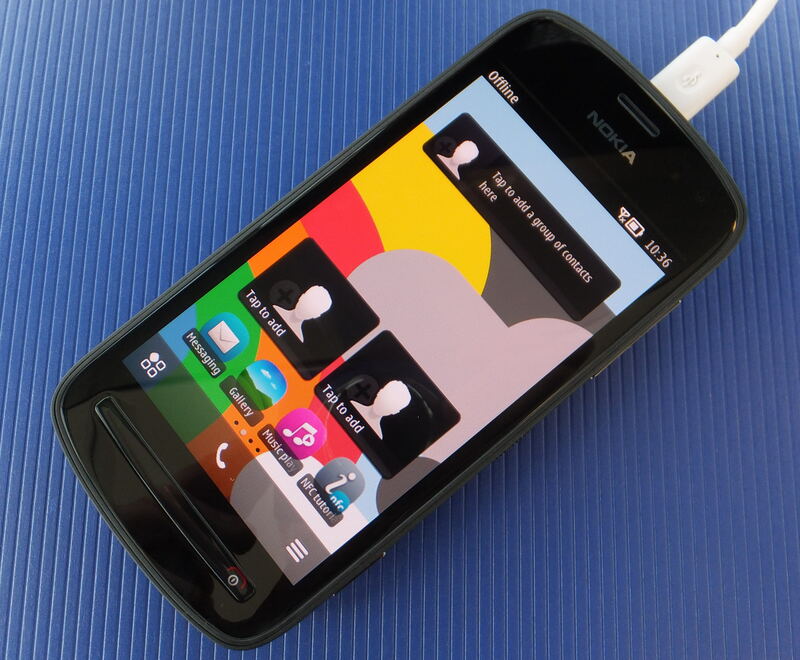 Symbian is one of the first multi-tasking operating systems for mobile phones and has seen many upgrades over the years. The phone is the latest camera centric phone from Nokia, with the previous camera phone, the Nokia N8, being highly regarded as one of, if not, the best camera phones available with a larger than normal 12 megapixel sensor. 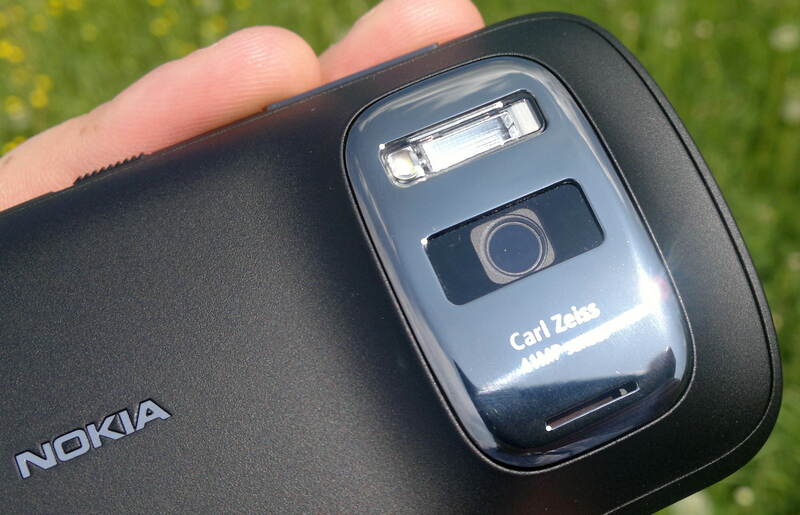 The Carl Zeiss Tessar f/2.4 lens has been specifically designed for this camera phone, as part of an exclusive partnership betwen Carl Zeiss and Nokia, that goes back five years. 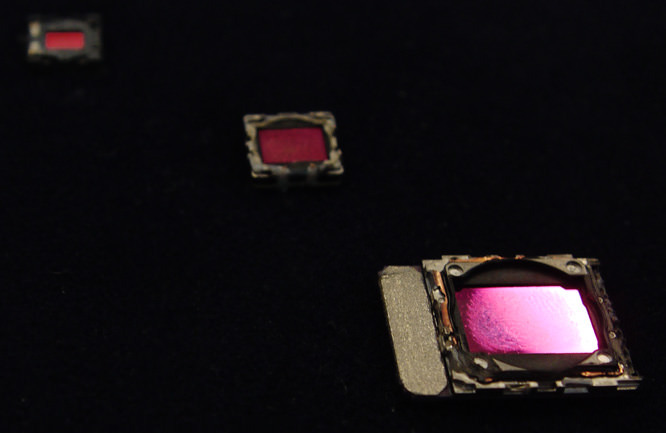 Carl Zeiss and Nokia explained that because the Carl Zeiss lens in the camera had to be much smaller than larger lenses, it meant they were able to use a much smaller parts in the lens and just 5 different pieces of glass. The level of resolution the lens is capable of producing has been compared by Carl Zeiss to the Carl Zeiss Planar 2/50 ZM lens, and Carl Zeiss has found that the lens in the PureView 808 is capable of out resolving the more expensive 50mm Planar. 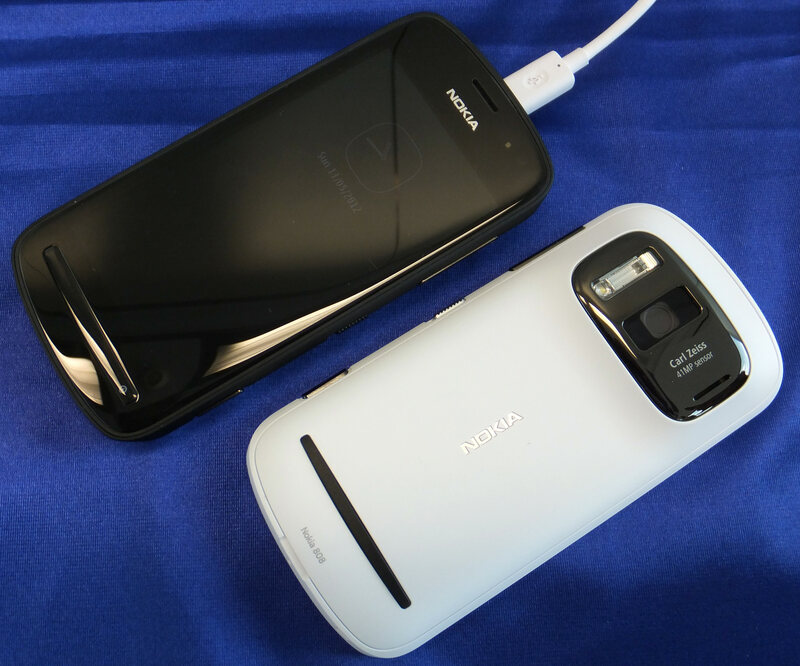 The Nokia PureView 808 sensor is much larger than any camera phone sensor and much larger than nearly all compact cameras (excluding the Canon Powershot G1 X), with a 1/1.2inch sensor, it's almost as large as the sensor in the Nikon 1 Series CSC. The sensor is exclusive to Nokia developed with Nokia's partner with Nokia IP. Nokia did not disclose who is manufacturing the sensor. 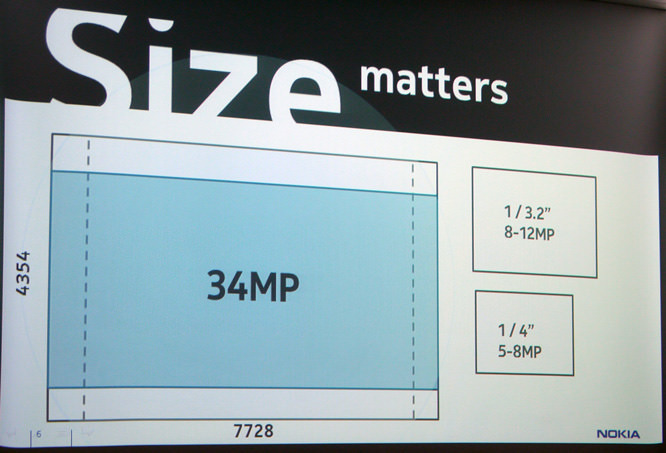 Nokia were keen to demonstrate the size difference between the sensor used in the Nokia PureView 808 compared to the typical 1/3.2inch sensor used in most mobile phones, such as the Sony Ericsson Xperia Arc, and the Apple iPhone 4. To create 16:9 or 4:3 images, the image is not cropped, instead different parts of the sensor is used, and the 4:3 image produces a 38 megapixel image with a 28mm wide angle view, while the 16:9 image produces a 34 megapixel image with a 26mm wide angle view (in 35mm equivalent terms). 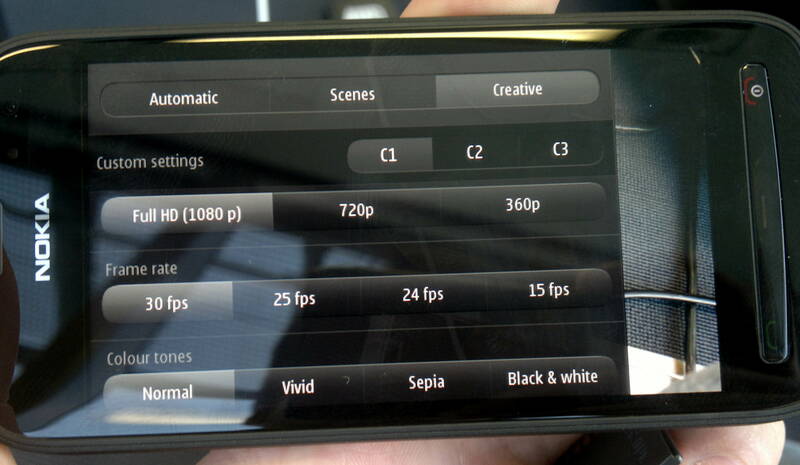 The Nokia PureView technology uses the large number of pixels available on the large sensor and combines a number of them (7 when in 5mp mode) into one "superpixel" (as Nokia calls it). This allows Nokia to reduce noise levels in the process, and combine colour information from 7 pixels into one, giving "superior" (again this is what Nokia are calling them) 5 megapixel images. Combined with a bright high quality f/2.4 Carl Zeiss Tessar lens, Nokia believes it's image processing algorithms are among the best in the imaging industry and that the oversampling technology overcomes Bayer pattern problems. A whitepaper on the PureView technology is available from Nokia (PDF). Handling - The top of the PureView 808 features a shutter release button, as you would expect to find on a compact digital camera, there's also an unlock switch (in the middle), as well as a zoom rocker. On the back of the phone, the large protruding lump is where the flash and lens is housed, and there is also a raised bar to give your hand additional grip. Pressing the shutter release button will take you straight to the camera and the camera is quick to come up. 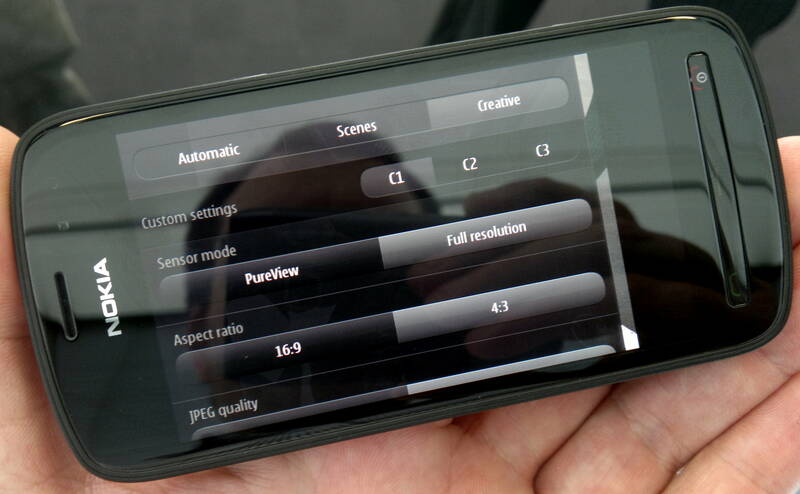 The PureView 808 features redesigned on-screen camera control compared to the Nokia N8, and it is much easier, and quicker to go through and change the numerous options, there is also greater control with more options than the N8. Despite the PureView 808 being constructed from plastics, it feels very solidly built and the gorilla glass screen is re-assuring, as is the devices weight in your hand. For those who may be concerned about camera shake, a Nokia tripod adapter is available, as well as a protective case that includes a lens cap - yes, on a mobile phone! The cases are available in the same colours as the phone: black, white and red. 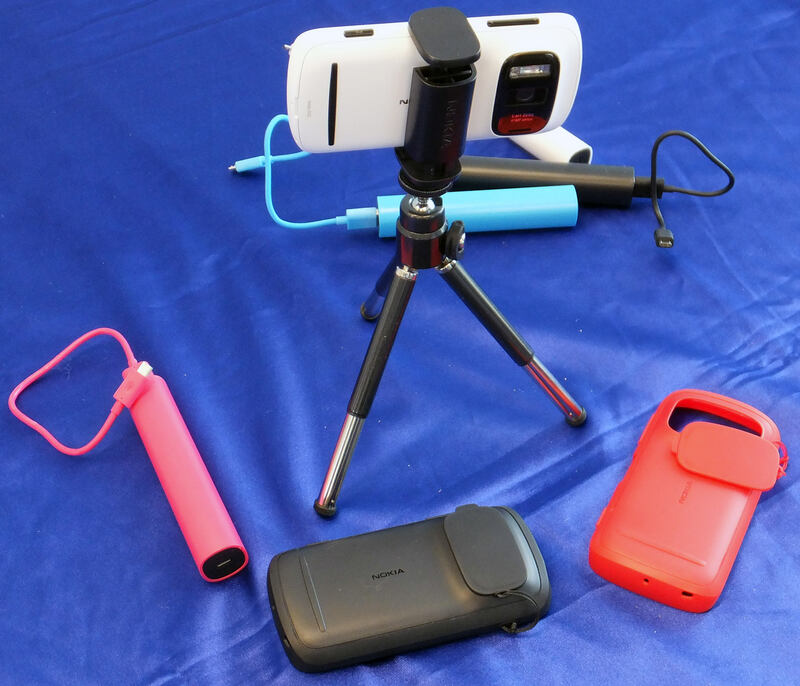 Shown along-side the tripod and cases are portable battery chargers. Menus - The camera menus give you three main shooting modes: Automatic, Scenes, and Creative. Automatic lets you control the flash and defaults to 5mp PureView mode, letting you zoom in and out. The scenes have the typical scene modes as found on most compact cameras. 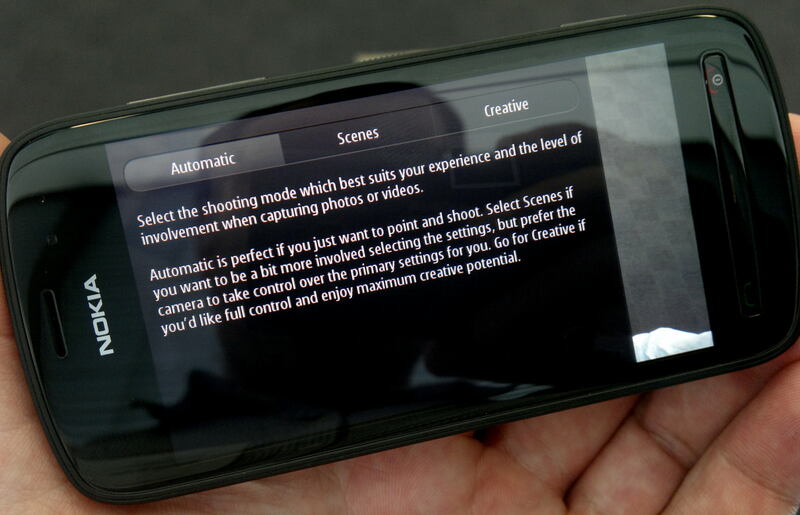 The creative options are where the fun begins, with three customisable sets of options (C1, C2, C3), including resolution (PureView or Full), Aspect ratio (16:9 or 4:3), Resolution (8/5/3mp in PureView), JPEG Quality (Fine or SuperFine), Saturation, Contrast, Sharpness. Other options available include: Focus assist lamp (On/Off), Capture when phone locked (Yes/No), Camera sounds (On/Off), Viewfinder grid (On/Off), Histogram, Focus modes (hold screen to choose between infinity, hyperfocal, macro, auto), ND Filter (Off, Auto, On), ISO50-1600, White Balance, Flash settings and exposure compensation. The majority of options can be set from the left hand side of the touch screen. The camera even has auto-exposure bracketing, letting you create HDR images if you want (although unfortunately the camera doesn't automatically merge them). Battery Life - The cameraphone features a new BV-4D 1400mAh lithium-ion rechargeable battery, and battery life is expected to be reasonable for a smartphone, depending on how much you use the phones features like GPS, Wi-Fi, Flash etc. Speed - Switching to the camera mode is quick, with the camera letting you go straight to the camera even if the phone is locked. There is an option to switch this feature on or off depending on which you prefer. Focus seemed generally quite quick, although we will need to test this more fully when we have the camera in the office for a full test. Here are a number of sample photos taken with the Nokia PureView 808, click the thumbnail to view a larger version, or click "Hi-Res" to view the full size original. Additional product photos and sample shots can be viewed in the Equipment Database where you can add your own product ratings and reviews, as well as sample photos. Sample photos - The camera gives impressive levels of detail in photos, letting you see things that you can't see with your own eyes. Photos show impressive dynamic range (shadow detail can be recovered), and areas where you expect the highlights to be blown are not. Colour is quite natural especially when compared to the high levels of saturation on other camera phones, this can be customised if you want additional punch. We left the camera on default settings for these shots. 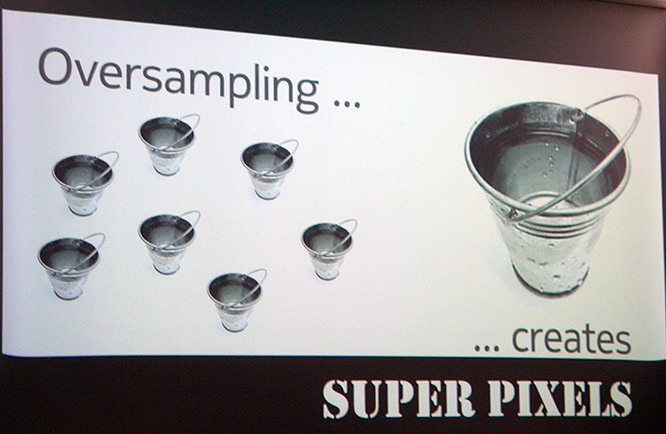 The 5 megapixel photos show impressive levels of detail, and these images were impressively clean, clear and crisp. ISO Noise Performance - It's quite rare for a digital camera to have an ISO50 setting, so it's nice to see it features on this one. Using the PureView 5 megapixel mode images taken at ISO50 and 100 show very low levels of noise, with excellent detail. At ISO200 you begin to see the start of noise creeping into the shot, and again this increases at ISO400, although detail and colour are still very good. ISO800 is where there is a slight drop in colour saturation and banding appears in the darkest areas of the image, although detail is still better than expected and should produce usable images. ISO1600 shows the highest levels of noise, as well as a drop in colour saturation and an increase in visible banding. At the full resolution ISO50 shows a little bit of noise in dark grey areas, although images are generally free of noise. At ISO100 noise increases slightly. ISO200 shows a more noticeable increase in noise, but detail and colour remains good. Again at ISO400 noise increases with noise visible in some of the lighter colours. At ISO800 noise becomes more noticeable again, with noise visible in the majority of light colours, although results still appear usable. At ISO1600 noise dominates the image, with banding appearing and the loss of detail. Nokia PureView 808 Video Options - The amount of lossless zoom available increases depending on what resolution you use: 1080p Zoom lets you use 4x zoom without any loss of image quality; 720p 6x zoom; and 640x360 12x zoom. The camera also zooms smoothly in if you do use zoom. Electronic image stabilisation is available, as well as 30/25/24/15fps frame rates, colour tone options including normal, vivid, sepia, black and white. Using digital zoom instead of optical zoom, means that zoom is completely silent. As this was not a final version of the camera we were advised we could not post video samples, although we will add this when we have a final version in for review. 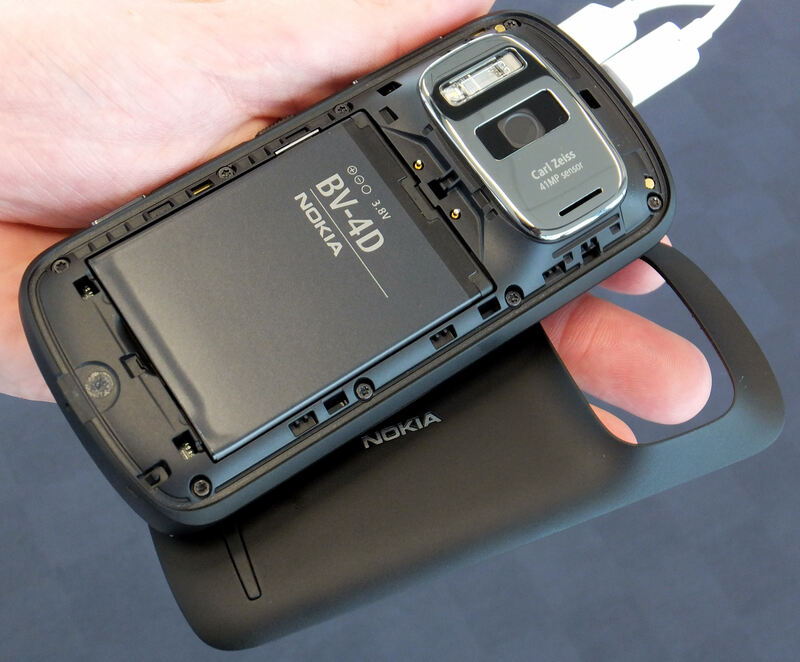 It's difficult to compare the Nokia PureView 808 to other products, because compared to other mobile phones it's at the more expensive end of the market, it should be available for £499 sim free in the next few weeks. However, if you compare it to similar resolution digital cameras, the closest compact camera features an 18.2 megapixel sensor, the Sony Cybershot HX20v is available for £329; the nearest mirrorless camera, the 24.3 megapixel Sony NEX-7 is available for £969; the nearest Digital SLR, the 36.3 megapixel Nikon D800 is available for £2599 without a lens; and a 40 megapixel medium format camera will cost at least £7999 without a lens. While some may be put off by the camera phones operating system, Symbian, the PureView 808 is running Symbian Belle FP1, which is the latest version and also appears to be dramatically improved compared to Symbian 12 months ago, and I would even dare to say that it's worth another try, as you may even find you like it. Nokia has said that it will continue to support Symbian until 2017 with additional updates to Symbian expected, and if you get really stuck, there are dedicated 3rd party support sites, such as AllAboutSymbian. The Nokia PureView 808 offers unprecedented resolution in any camera, let alone a camera phone! This high resolution gives Nokia the chance to offer some unique features, such as lossless zoom (cropped 3x zoom at 5 megapixels) that's not all gimmick, for example instead of the lens aperture stopping down in normal optical zoom, the PureView 808 continues to use f/2.4, allowing more light onto the sensor. Even if you're not interested in the lossless zoom, you can shoot at 34 or 38 megapixels, and simply zoom into the photo on the phone or on a computer and amaze yourself with the level of detail the camera captures. Especially when it can capture more than you can see with your own eyes! The PureView technology also uses the larger sensor to its advantage by providing 4x lossless zoom recording videos at full HD and the phone has a number of advanced video options. The large sensor is of additional benefit in low light with the 5 megapixel images showing very low levels of noise, even up to ISO800 / ISO1600 and combined with the bright f/2.4 lens and bright Xenon flash, the camera should be an excellent performer in less than ideal lighting conditions. If you compare the price of the Nokia PureView 808 to other digital cameras, and try and get anywhere near the same resolution, you're going to need to spend between 2 and 5 times as much money, and you could easily spend a lot more adding premium lenses. While the mobile phone world may have (mistakenly) written off Symbian, I think the photography world should give this camera, I mean camera-phone, some very serious consideration. Sure, for a phone this is impressive. Zeiss has certainly set a new goalpost for micro-technology. Especially if you see the crappy images produced by my ipad2, you wonder why they bothered to install a camera at all. But as the others say, how do you focus on a flimsy screen? how do you set the aperture? Look at the butterfly picture and you'll see when they took the pic they focused on the finger. To be honest, I'd rather have less resolution and also less distortion. The 'zoom' is pretty soft seen from here. A phone camera remains an emergency camera replacement... I like to have control over my images and 41 MP seems a waste without a proper viewfinder. Sure, for a phone this is impressive. Zeiss has certainly set a new goalpost for micro-technology. Especially if you see the crappy images produced by my ipad2, you wonder why they bothered to install a camera at all. But as the others say, how do you focus on a flimsy screen? how do you set the aperture? Look at the butterfly picture and you'll see when they took the pic they focused on the finger. To be honest, I'd rather have less resolution and also less distortion. The 'zoom' is pretty soft seen from here. A phone camera remains an emergency camera replacement... I like to have control over my images and 41 MP seems a waste without a proper viewfinder. OK, I can see how, and why this will impress a lot of folks. 41MP is as David said a bit mind-blowing. But what need is there for that in a camera phone? I think micro-technology (like other areas of technology) is now at a stage that folks can cherry pick what they want. Me for instance. I am happy with a phone that is just that - a phone. That way I can leave it behind if I want to go off with my own company to take pictures. Or even with friends if we want to take pictures and talk photography without the world butting in. And as Annette says there is very little real control over the images. 41MP on a proper camera would be a better idea. If they can do it for a mobile phone at a reasonable price, why not do the same for a real camera? OK, I can see how, and why this will impress a lot of folks. 41MP is as David said a bit mind-blowing. But what need is there for that in a camera phone? I think micro-technology (like other areas of technology) is now at a stage that folks can cherry pick what they want. Me for instance. I am happy with a phone that is just that - a phone. That way I can leave it behind if I want to go off with my own company to take pictures. Or even with friends if we want to take pictures and talk photography without the world butting in. And as Annette says there is very little real control over the images. 41MP on a proper camera would be a better idea. If they can do it for a mobile phone at a reasonable price, why not do the same for a real camera? Having resisted peer pressure to upgrade to any kind of new-fangled smartphone, so far... I think this one will soon be putting a dent in my wallet :) While I appreciate the previous comments made here, the selling point for me is that it is an impressive camera with phone capabilities - rather than the other way around. While I appreciate the previous comments made here, the selling point for me is that it is an impressive camera with phone capabilities - rather than the other way around. at first, I thought great. gotta have this, a phone and walk-around camera all in one. then I read the o/s is Symbian, and even worse is eventual migration to MS. the o/s is a deal breaker. a pity. Nokia o/s and support has and will be the company's Achilles heel. N should have made its phones open source. for proof of how open source is popular, consider Samsung - now the #1 phone worldwide by a long shot. After-Sales Support Problem with 808 within the first year after purchase. Although Nokia provide a "European Warranty" for phones bought on the continent, there are no repair centers within the UK to provide FREE support in the case of a technical malfunction [requiring labour and/or replacement parts] should this occur. After-Sales Support Problem with 808 within the first year after purchase. Although Nokia provide a "European Warranty" for phones bought on the continent, there are no repair centers within the UK to provide FREE support in the case of a technical malfunction [requiring labour and/or replacement parts] should this occur.